Home > Medical Stories or Interesting True Stories > Is Medical Technology Dumbing Physicians? 1989 December Romania’s door slapped open and it stayed open ever since. People started to go in and out (mostly out). It was a hunger of traveling that only somebody who lived it through can imagine. A supermarket queue, a common streetscape in Romania before 1989. It could be for anything: for bread, milk, oil, butter, tooth paste... in very lucky days meat or cheese. All in small quantities, for the first dozens of people from the queue. Don't you dare imagine that all items were available at once, with one queue, but any ONE of them! People coming in were of several sorts. Some were Romanians who had illegally fled the communism and now were able at last to come and… – yes, it might seem declamatory, but imagine just how must feel somebody who comes to visit his home village, bows and kisses the earth! I know personally such a person. There was Herr Doktor Hans accompanying that medical transport and ensuring that all goes well. After having set everything on a good path, he said he’d be interested to see how our health system was working. Since it didn't allow any private doctor’s offices, and the equipment in the hospitals was so obsolete, how the hell, sorry, how could it possibly be working?!?! He was taken to one of the Dispensare scattered around. A Dispensar is a kind of (state run) general doctor’s office taking care of medical needs of people in the area. Size order: a Dispensar for a village. That is, for 2-3 hundred families. This ratio stayed also in the cities. People coming to these general doctor's offices got a referral with the temporary diagnosis and were sent to a hospital or a clinic. Herr Doktor Hans spent an afternoon in such a Dispensar. Of course, it was all Romanian language around and he was German. But even so you can see that there are only really basic things around. Even so you get an idea what's going on. And you do hear the doctor saying to the nurse little words like Tetralogy and Fallot while listening the patient with the stethoscope. “Come on, you don’t mean the tetralogy of Fallot?!? !”, Herr Doktor Hans asked in disbelief. Dad's stethoscope as a toy... It has no other connection with the story, I only thought it was cute. Romanian schools did teach English, French or German. And the foreign movies in their original languages with subtitles had (and thanks God still have) also their share in Romanians having on a large scale a good idea of (or easily learning) languages. But in such a closed country as Romania was until 1989 this ease in languages is still a wonder. The more so when I know that librarians got indications from the dreaded Securitate: if anybody borrows books for learning foreign languages, the librarians should secretly announce it. That could be a clue that that person had intentions to leave the country. Don’t look at me, folks (unless you too belong to that species of half-Gods called physicians, close relatives with the pilots), I understand it the same as you. It was a doctor telling me this story, Ciprian, the same from this elephants story. I had him write the name of the disease for me, because he had rolled the words the way I’d say “It’s raining”. He was obsessed by that stethoscope. “Come and listen by yourself”, the Romanian doctor said. … “Well, I can hear there is something not quite OK with his heart, but how on Earth… ?! Fallot?!? And VSD?!? !” He was that angry, that he didn’t care anymore that there was a patient in there. Now, 8-9 mm is a huge hole. And that was too much of too much. 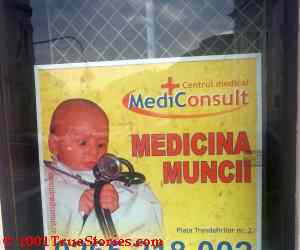 Herr Doktor Hans followed that patient from the shade on his ways deeper in the Romanian health system. Lo and behold. Patient’s end diagnosis: Tetralogy of Fallot with aberrant left subclavian artery. Ventricular Septal Defect, diameter: 8 mm. “If any doctor in the Western world can set this diagnosis solely by stethoscope, I eat my diploma." … I would be so much delighted that my nurse in that so noble women Klinik in Vienna / Austria reads this. I mean THE nurse (from this story about my unexpected birth) who, yes, was very professional and even nice, but still could barely conceal her superiority toward us, poor creatures from our Eastern countries, while asking me where on Earth have I made my echographies.